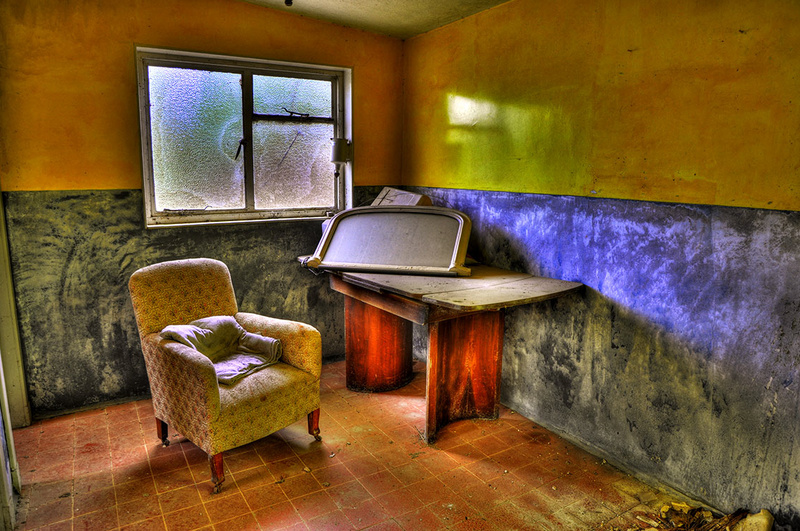 A while back I published some aged HDR pics I'd taken, including one of an office at an old, disused quarry near the Perthshire village of Newtyle. That's the abomination in question below. The response in some quarters was quite brutal (only teasing) with a few readers leaving me in no doubt of what they thought of this digital carry on. Steve: "HDR make me want to puke, just saying'. Please stick to film related articles." Folker Neumann: "Do not like HDR! It´s unnatural for me." Andrea Ingram: "Yes, I see what you mean about garish!" Herman Sheephouse (my pal, Phil! 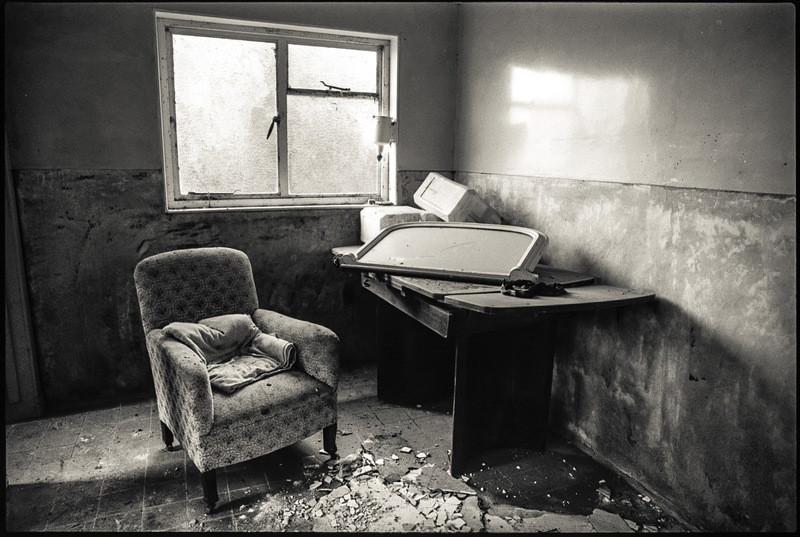 ): "Bruce - they are feckin' ghastly…"
A few weeks ago I found myself passing the same quarry whilst out for a day trip with Cath and my old mum and left them to blether in the car for 15 minutes while I went back in and took much the same photograph of the office. The digital shot was taken with the 35mm equivalent of a 21mm lens on the Pentax K10D I was using at the time. The widest lens I had with me on the return was a 24mm for my Olympus OM2. I prefer the wider angle of view as I really like the junction of the walls and ceiling. My back was against a wall with the OM2 so it's impossible to get any more in. The film was Silvermax, downrated from it's 100 ISO to 50 ISO for development in Spur HRX. I used my recently-adopted and slightly lazy approach of putting the OM2 on a tripod, using the auto exposure and bracketing plus two and minus two stops either side of the indicated time. I should really just dispense with the underexposure as I haven't photographed a scene yet that's benefited from it and it's a waste of film. The camera's choice of auto exposure was a reasonable balance between the shadows under the table and the light coming in through the window but the +2 shot was a more flexible negative. As I explained in an earlier post, the OM2's exposure meter at long exposures averages out the entire scene so it's never going to be too far off in a situation like this. And if I was going to go to that bother, it would make more sense to get a wide angle for the Speed Graphic and do it on 5x4. Come to think of it, the detail and texture in the scene just calls out for large format, doesn't it? It's a beautiful photograph Bruce and the exposure / development looks spot on. Great image and well exposed. Like it! The tilt/swivel/rise movements of the Speed Graphic might have been advantageous such as for the window. It just shows that a good photographer doesn't need tricks, just the patience to go back and do things again and again until it comes out right. Much better on film! Agree, I don't like the HDR at all, but my 13 year old granddaughter thinks HDR is cool. Sooner or later, you might feel that you just have to go back with Sekonic and tripod, give wife and mother a good book each, meter for the shadow under the desk (Z3 perhaps ?) and give it minus-something development to do justice to all that interesting detail in the dirty window. The tripod and bracketing already suggest your state of mind when faced with this sort of scene. Might be 5x4, might be 120 – who knows? Either would be a feasible choice, but you could get more deeply into the corner with 120. You can examine the screen from the side, but there's no alternative to hunching up and squatting behind a 5x4. But please continue to slip in the occasional inappropriate image to enrage your dedicated fan base, as it does seem to encourage comments. Disgusted of Ilford rides again, eh? Actually, the 40mm lens I have for the Rollei SL66 would be perfect for this scene. As you say, the square format would be better for squeezing the ceiling/wall junction in and the lens is certainly wide enough to capture the various elements. Just need to send off for some 120 - ran out a few weeks ago. I haven't got a wide angle for the Speed Graphic otherwise I'd have a go with it. Mind you, I could always capture the scene with two 5x4 negs and stitch them together in Photoshop. Haha! See, that film shot is orders of magnitude better then the hdr one. You could print that on some lovely FB silver gelatin paper and hang it in a gallery.